The home office is no area to slack on when it comes to the design of the home. This is definitely a place where you want to use a little “feng shui” when designing, so it doesn’t become a cluttered mess. The office should be a sanctuary in your home; a place where you can foster ideas easily without feeling stressed out with heaps of papers, unorganized bookcases, etc. 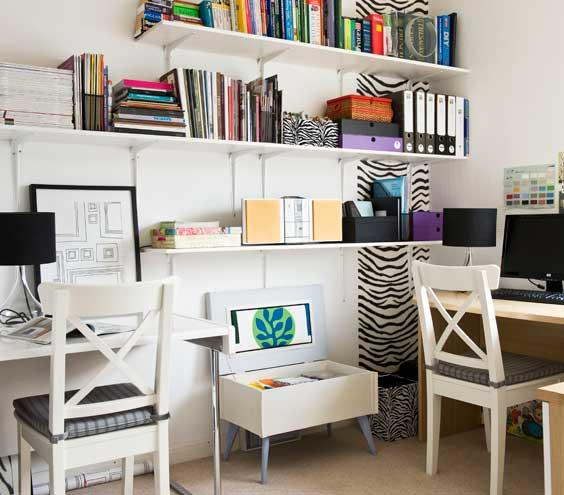 Here are some top home office ideas that you should implement to make it much more cool and conducive to getting work done. It’s been said that looking outside of a window and seeing something green in nature can boost your creativity and give you fresh ideas. Additionally, the natural light is bound to keep you awake and alert throughout the day. Place your desk in front of a window for a view and better lighting. While it’s generally best to keep your home office outside of the bedroom, for quality of life and sleep reasons, you can set up a distinct are in your bedroom that can be used as a home office. Just ensure that the elements look different from the rest of the room, so that it is clear which area is for studying and working, and the other for deep and relaxing. 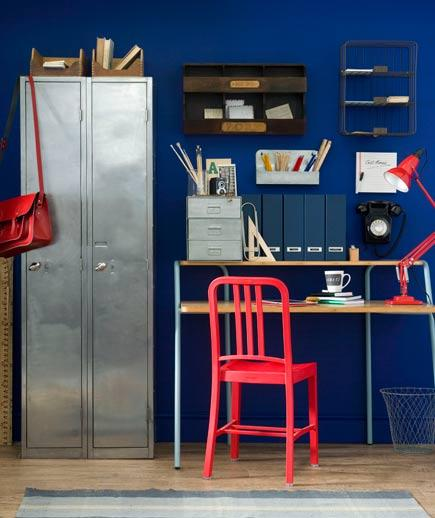 Add some bold pops of color to your office in your home. It’s a cool way of adding some creativity and energy to your working space so you can get things done. 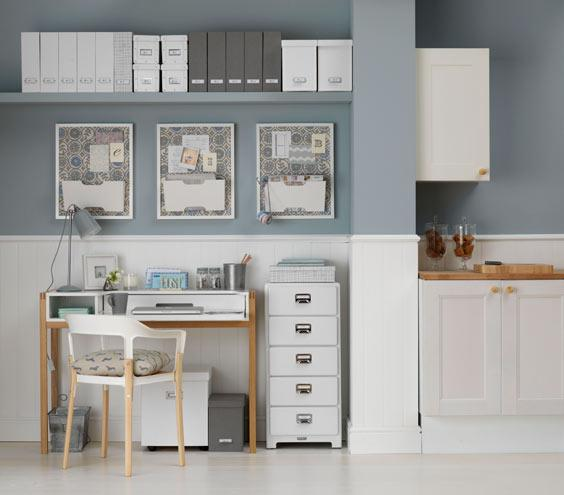 Maximize your wall space with these ed to end shelves that can hold all of your important documents, or simply display some of your favorite things. It may be a bit unconventional to split your kitchen with your office – but why not? If you have an archway or a little walled off area, add a desk to the side of your kitchen in order to maximize your space and keep the room flowing. Use this nook to inlay your home office right into the wall. It’s a good way of keeping your important documents as well as computer and work related out of sight, somewhat. It’s a great way of relieving yourself of stress and providing some security, making your documents a little more hidden. While the bed and office generally shouldn’t be mixed due to stress, etc. If you have some light work that you like doing, you can add a desk to your room with a lush, fancy, cool chair right next to it. Just try not to stress yourself out before bedtime and use a cool, pastel color palette. This is for the couples who like being in the same room, but are working on entirely different projects and ideas. Spit up the desk and create two different areas while keeping the design the same for unity. If you enjoy working right alongside with your business partner, you are definitely going to want to add this cool idea to your home office. Using two separate tables or the same one, you can make separate working areas for you and your partner while being close. Wow! 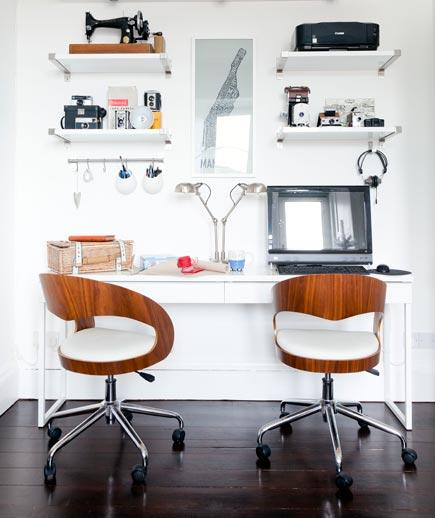 That will be the first word that pops out of your mouth when you’re done with this home office. This bright wall spurs creativity and innovation.